Honda is all about innovation and pushing boundaries, but how about building the fastest lawn tractor in the world at 130 mph? Can you imagine how many guys would be dreaming about the weekend so they could mow the lawn? That’s what would happen if Honda brings their latest creation to production. They have created an extraordinary piece of machinery in the Mean Mower that is the fastest lawnmower on the planet. Why did they do it? Because it has never been done before. For now, this is a one-off creation that would be the envy of the neighborhood. Honda (UK) teamed up with their title winning British Touring Car Championship (BTCC) partner, Team Dynamics because they wanted to build something special. And special it is, with 109 hp, and the Man Mower is geared to reach a top speed of 130 mph. Honda and Team Dynamics re-engineered a Honda HF2620 Lawn Tractor and fitted it with a custom chassis and a 1000cc engine and wheels from a Honda ATV Firestorm. Can’t you just see guys lining up on the street to drag race these on Saturday morning? Honda’s goal was to keep the original look of the lawn tractor but create a fire-breathing machine that would light up the yard. They definitely succeeded as the Mean Mower looks tame enough and can still cut grass. But that’s where the similarities end. This super-fast lawn mower has two electric motors on the cutter deck, spinning 3mm steel cutting cable at an incredible 4000rpm. The mower cuts grass at 15 mph, more than double the flat-out speed of the original Honda HF2620. And how about a sprint time of 0-60 in just four seconds! That would leave more time for guys to hit the local lawnmower drag strip. The Dynamics team was also able to keep the original look by re-engineering the grass bag to house the fuel tank, a high capacity oil cooler and a secondary water cooling radiator for the high-performance 1000cc powerplant. The custom lawnmower also features a custom-made paddle shift six-speed gear system, Cobra sports seat, a Scorpion exhaust system and a steering rack taken from a Morris Minor. This lawn tractor isn’t just for show. Honda has taken the Mean Mower out to the test track and has already seen some incredible test times and speeds. In initial testing, the mower has topped 100mph on a circuit, belting out a remarkable 130db at three-quarter RPM and 98db at idle. Now that’s one fast piece of lawn equipment. In collaboration with Team Dynamics, Honda wanted to use genuine Honda parts where possible. They used factory brakes and several components from their motorcycle division. Almost everything else has been custom-made by Team Dynamics and its partners. 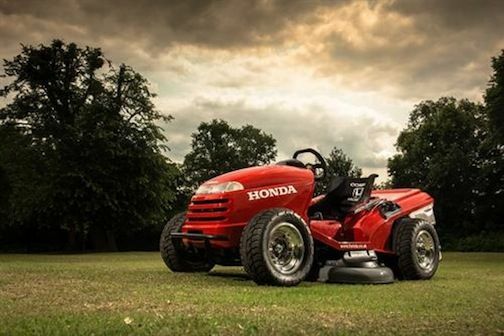 Honda delivered on the goal to build the fastest lawn tractor on the planet. The Honda Mean Mower with 109hp and a top speed of 130mph would make lawn mowing something to look forward to and definitely not a chore. Maybe Honda will get enough requests and bring this one-off special mower to production. Put on your racing gloves and get ready to mow the lawn in record time. Watch Honda’s Mean Mower video.